Dreams.com is developed and managed by “DreamsMaster” Laynee Gilbert, M.A., a longtime specialist in dreams. Laynee began studying and working with dreams as a counselor in the 1980’s, under the mentorship of Dr. Arthur Bernard (see Spotlight). Over the years, Laynee has worked with hundreds of individuals and groups to uncover the meanings of their dreams. You can see some of her dreamwork in action in the Dreams.com Dreams Library. She’s the author of The Complete Dream Journal (Pomegranate Communications) as well as several other books on the subjects of grief, journal-writing and parenting. 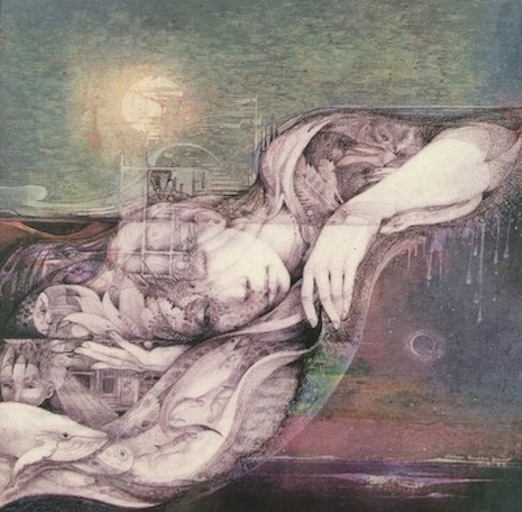 Susan Seddon Boulet (American, b. Brazil, 1941-1997) drew from nature, Jungian psychology, and global spiritual traditions (particularly those of Native Americans) to create a body of work that has helped guide many along a path of discovery and enlightenment. Her paintings are held in collections around the world. Laynee had the remarkably good fortune to have Susan Seddon Boulet’s paintings grace the cover of her dream journals (both first and second editions). The books are no longer in print by Pomegranate, but a Kindle version designed to be used in conjunction with a blank book for journal-writing is available through Amazon and L.O.A. Publications.